Summer study programs are created to broaden horizons. Janefrancis Chinonye Egbosiuba and Justin Michael were expecting that when they applied for the first CUPID program offered at IU in 2016. What they didn’t expect was the breadth of the seven-week program and how those few weeks would influence their careers. Both had an interest in caring for the medically underserved. Oncology was of interest to Jane, but not so much for Justin, who wanted more lab and clinical experience. 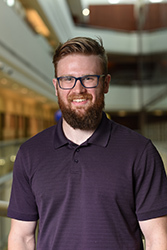 Ryan Erdwins, who is a second-year medical student at Pacific Northwest University of Health Sciences in Yakima, Wash., applied for the 2018 CUPID summer program specifically because of its focus on underserved populations and training in both bench research and cancer care. CUPID – Cancer in the Under-Privileged Indigent or Disadvantaged – was founded a dozen years ago by Richard Zellars, M.D., when he was on faculty at Johns Hopkins School of Medicine. In 2015, when Dr. Zellars accepted the position of chair of the Department of Radiation Oncology at IU School of Medicine, he expanded his program to the med school and IU Simon Cancer Center. CUPID provides four second-year medical students the chance to shadow medical oncologists, radiation oncologists and surgical oncologists as they work with patients from underserved communities in the Indianapolis area. CUPID offers a similar opportunity for students from Johns Hopkins and Ohio State University, a recent addition to the program. During the seven-week program, students also attend daily videoconference lectures delivered by IU, Ohio State and Johns Hopkins faculty and conduct research and basic science lab work alongside faculty mentors. ﻿Ryan was the only one in this summer’s program who was not an IU medical student. A native of Washougal, Wash., he is studying osteopathic medicine and was attracted to Pacific Northwest University of Health Sciences because of its focus on medically underserved and rural populations. While growing up in Washougal, a rural community with surrounding areas of poverty, Ryan said he became aware at an early age how cultural and income differences influence the health care available to others. He also learned in high school how important compassionate physicians are when his mother, Kari, was diagnosed with Stage II ovarian cancer. He was a sophomore in high school and was able to go to clinic appointments and meet many of her doctors during her treatment. After a brief remission, his mother passed away at the start of his sophomore year in college. When not in clinic or the classroom, Ryan worked in the lab of Marc Mendonca, Ph.D., professor of radiation oncology and of medical and molecular genetics at IU School of Medicine, director of Radiation and Cancer Biology and a researcher at the IU Simon Cancer Center. In the lab, Ryan researched genes that are involved in cancer metabolism when exposed to radiation. Like Ryan, Jane also has a deep respect for indigent populations and a deeper desire to ease their burden. And, like Ryan, she knows the fear a family cancer diagnosis can cause. Jane started school in Nigeria but immigrated in fourth grade to Georgia with her parents, who gave up careers as lawyers to seek better opportunities for their four children in the United States. Jane and her identical twin sister, Maureen Chinenye Egbosiuba, attended the University of Georgia before applying to medical school. Maureen is a medical student in Atlanta and Jane is studying on the Indianapolis campus of IU School of Medicine. Her interest in CUPID was fueled by the program’s emphasis on areas that parallel her interests: clinical care, research and medically vulnerable populations. Growing up in Nigeria, I’ve experienced people with unmet medical needs. I’ve gotten to live in two different worlds with different perspectives and cultures. I feel I have an instant connection with people with dissimilar experiences. Pursuing those interests as an oncologist hadn’t been her sole focus when she entered medical school. Circumstances and the CUPID experience set her direction. About the time she applied for CUPID, her father was diagnosed with colon cancer. His treatment was successful. “CUPID opened a lot of doors for me. One of my favorite parts was shadowing a medical oncologist. I wanted to know what they do and how they get through their emotionally challenging days,” she said. Jane said studying graft-vs-host disease in the lab of Sophie Paczesny, M.D., Ph.D., professor of pediatrics and of microbiology and immunology at IU School of Medicine and a researcher at the IU Simon Cancer Center, was an invaluable opportunity few medical students are afforded. Another favorite part of the program was a trip to Washington, D.C., where she learned about health policy and how changes in policy occur. The unique opportunity made her more aware of the challenges physicians and patients face, she said. Now in her final year of medical school, Jane is eager to begin her residency training in internal medicine. Justin Michael, who with Jane was one of four students in the initial CUPID program at IU in 2016, had decided he did not want to treat patients with cancer -- until he met Dr. Zellars and experienced CUPID. “The program ended up being the best thing I ever did,” he said. A native of Columbia City, Ind., Justin also has an identical twin, Josh Michael, who is an attorney in Fort Wayne, Ind. Justin, who is enrolled in the Rural Medical Education Program at IU School of Medicine – Terre Haute, learned about CUPID when Dr. Zellars visited the campus and spoke to a medical class. Justin was hooked because of his interest in rural and underserved medicine. He was not interested in oncology, primarily because he had a misconception about the survival rates for cancer patients. He expressed his concern to Dr. Zellars. “A lot of my patients survive, and I develop strong and meaningful relationships with many of my patients,” he said Dr. Zellars assured him. Then, when he saw the smiles and camaraderie of patients in the infusion area, he took a second look at oncology as a career choice. He now is on a path to becoming an oncology neurosurgeon and his enthusiasm for his future career is palpable. He has high regard for Dr. Zellars and the associate dean and director of the Terre Haute program, Taihung Duong, Ph.D., who have guided and encouraged him. “I couldn’t have asked for better mentors,” he said. Giving back is part of his makeup and Justin hopes to one day start a scholarship program similar to CUPID to enrich more medical students’ experiences. His summer of CUPID also took him to the lab of Theresa Guise, M.D., professor of oncology, medicine, pharmacology and toxicology and endocrinology at IU School of Medicine and a researcher at the IU Simon Cancer Center, where he did research on bone metastasis. 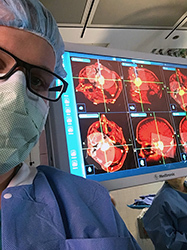 Justin’s experience with CUPID encouraged him to apply for a one-year fellowship, the Pauletta and Denzel Washington Family Gifted Scholars Program in Neuroscience at Cedars-Sinai Department of Neurosurgery, where he spent the past year. He is the only non-California resident accepted into the prestigious program. This experience will delay his medical school graduation by one year, but Justin says it has strengthened his resolve to be a neuro-oncologist and work with underserved patients. One thing is apparent when speaking with the CUPID students: They all enter the program with a desire to serve and leave with an even stronger drive to give back to the underserved. Shortly after settling into his new job as chair of the Department of Radiation Oncology at IU School of Medicine in January 2015, Richard Zellars, M.D., already began thinking of duplicating his successful summer program – Cancer in the Under-Privileged Indigent or Disadvantaged (CUPID) – at IU that he had started at Johns Hopkins University in Baltimore. Read more from this 2016 feature story. 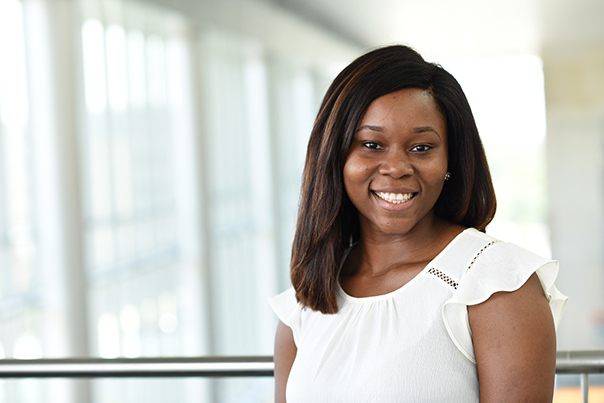 Janefrances Egbosiuba, a student in the first CUPID program at IU in 2016, is interested in clinical care, research and medically vulnerable populations.